Austin is known around the country as a top travel and business destination, and is now gaining attention internationally. Austin has seen an uptick in its global audience in recent years thanks to popular events and increased media coverage of the city&apos;s booming music, culinary and technology scenes. In early March, British Airways completed its first nonstop flight between Austin and London, opening up a promising trans-Atlantic link with one of the city&apos;s top overseas markets. Not only will this bring in more UK business and leisure travelers, but it also presents Austin to visitors from other EU and international countries. 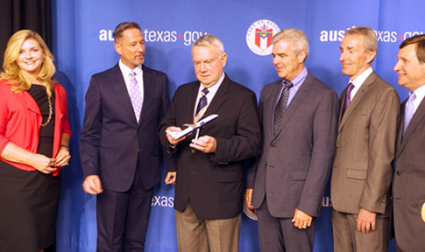 The new London route comes a few months after Aeromar, Mexico&apos;s leading regional airline, began service between Austin and Mexico City, adding to the list of available routes to and from the city. The new routes help serve a growing international audience for many major Austin events. Circuit of The Americas(TM) hosts the annual Formula 1 United States Grand Prix, one of the top sporting events of the year, as well as MotoGP(TM) and United Sportscar Racing. The course will also be the new North American home for the X Games Austin, which draws thousands of national and international athletes and their fans. Austin&apos;s growing art and food culture have gained recognition with marquee events such as SXSW®, the Austin Food + Wine Festival, Art City Austin Festival, Austin City Limits Music Festival and the Austin Film Festival. The city recently welcomed thousands of overseas visitors for SXSW®, the renowned conference and festival dedicated to music, film and interactive technology. This event attracts business professionals, music fans, film pros and tech experts from around the world, with international presence increasing every year. In 2014, the music festival featured 553 international acts from 57 countries; the interactive conference had over 32,000 participants representing 82 countries; and the film conference brought in over 18,000 participants from 66 countries. These numbers are only expected to grow next year, especially with more media attention about Austin and SXSW® circulating the world via print, online and broadcast coverage. SXSW® and Austin have seen growth in press and media coverage both nationally and internationally on an unprecedented scale. In addition to extensive coverage by major news outlets throughout the festival, comedian and television personality Jimmy Kimmel transported his talk show to Austin for the festival, where he filmed five original segments at The Joe R. and Teresa Lozano Long Center for the Performing Arts. His visit included exploring the city, touring the University of Texas and discovering the best barbecue spots, all of which he gladly broadcast to the world. Among his many guests was celebrity chef Rachael Ray, in town for her annual day-long event, the Feedback Festival hosted since 2008. As the festival and other major events continue to book in Austin, the city will continue to innovate and expand, bringing more acclaim and attention from international markets and new overseas visitors.